Our brined turkey is slow roasted and smoked to perfection! Prepare The Brine: Combine the first 6 ingredients in a large pot; bring to a boil. Cook 5 minutes or until sugar and salt dissolve. Cool completely. Remove giblets and neck from turkey. Rinse turkey with cold water; pat dry. Trim excess fat. 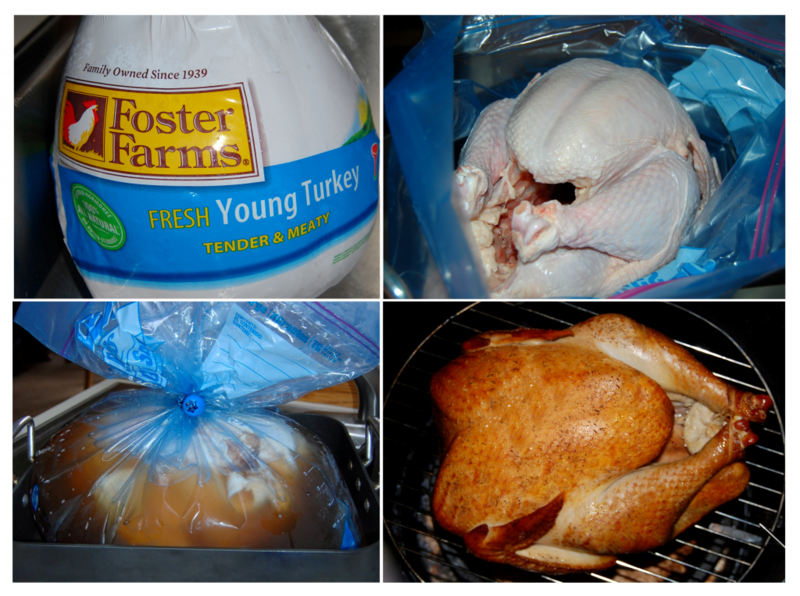 Place a turkey-sized oven bag inside a second bag to form a double thickness. Place the bags in a large pan or pot, large enough to hold your turkey. Place the turkey inside the inner bag. Pour the cooled brine mixture over the turkey. Secure bags with several twist ties. Refrigerate for TWO days, turning occasionally. The first thing you will need for a good smoked turkey is a GOOD turkey. Make sure it is a fresh turkey. This means an all natural turkey without injections and solutions If you do pick up a frozen turkey, always follow the instructions for defrosting. Choose a 12-16 pound turkey, if you need more, consider smoking two turkeys. You will need a smoker, a good meat thermometer, a good hardwood like cherry or apple, although hickory and oak can add a nice flavor as well. Run the smoker at temperature range of 235 degrees F to 250 degrees F. Plan on 30 to 40 minutes per pound. 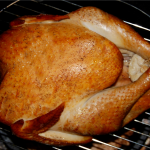 Smoked turkey has a different color and texture than oven roasted turkey. The meat may appear pink and have a smoother texture. This is normal. The smoking process causes a chemical change in turkey that changes the color of the flesh. As long as the turkey registers a temperature of 165 degrees F. (testing in at least two places away from the bone) it is safe to eat no matter the color. Step One: Make sure you have everything together before you start. The turkey needs to be completely thawed. Remove all the stuff inside and trim off any excess skin. Remove any pop up timer devices, wash in cold water and pat completely dry. At this point you brine your turkey in the refrigerator for two days. Step Two: Prepare your smoker. Wash and sterilize everything! You will want to build a fire to hold a steady temperature right around 235 degrees F. Since most smokers start hot and cool down as the fire settles into a good smoke that you plan on putting the turkey in at about 250 degree F and let the smoker drop down to the cooking temperature. Step Three: Brush some olive oil to keep the skin moist and help your turkey develop a rich deep tan. You could also apply your favorite dry turkey rub. Step Four: Put the turkey in the smoker breast side up. Use a roasting pan or heavy foil to help reduce any mess or just set it on the rack. Check the smoker temperature every hour or so to make sure it's behaving properly, otherwise you won't need to do anything with this turkey for several hours. Step Five: Calculating 30 minutes per pound at about 230 degrees F, determine the approximate time that the turkey could be ready at the earliest. This is when you want to start testing for doneness. Using a good meat thermometer to test the internal temperature turkey in two different places, leaving the thermometer in long enough to get a good reading. Remember, don't test too close to bone. When you have two reading about 165 degrees F., then you can take the turkey out. Step Six: Let the turkey rest for about 15 minutes and carve. Giving the turkey a rest will allow the meat to relax, the juices to flow, and the temperature to come up a little and even out. This is one of the secrets to a GREAT bird. Don't rush to carve your turkey or it will be dry!